Guest, Peter 2005. 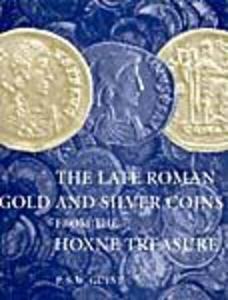 The late Roman gold and silver coins from the Hoxne Treasure. London: The British Museum Press. Discovered in 1992, the Hoxne Treasure is perhaps the richest cache of gold and silver coins, jewellery and tableware from the entire Roman world. The core of this volume is the catalogue of the 15,000 late 4th- and early 5th-century gold and silver coins, together with an in-depth discussion of the production and supply of late Roman coinage. Hoxne's silver coins are particularly interesting, and the book also contains ground-breaking discussions of the silver content of Roman currency as well as of the peculiarly British phenomena of coin clipping and copying. The value of the Hoxne Treasure in shedding light on an otherwise dark period of British history also calls for a broader, non-numismatic perspective, and the volume includes an important chapter dealing with the social significance of precious metals in the later Roman empire, particularly their role in the gift-exchange networks that defined and maintained late Roman imperial society.